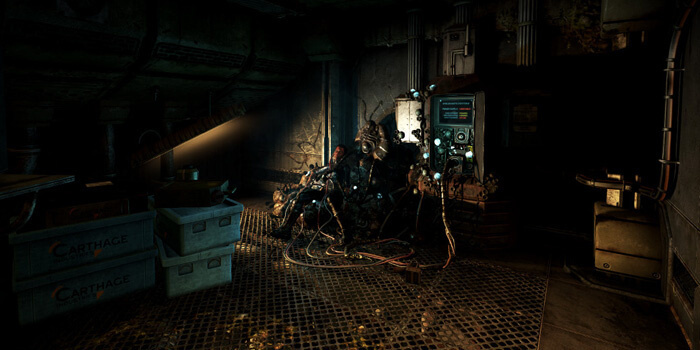 Soma is the new survival horror game from Frictional Games whose previous work includes Amnesia: The Dark Descent. Much like that game this features virtually no combat at all, most of the game is exploration with some stealth sections occasionally. I knew the location of the game world but I had no idea it would be so sci-fi focused. The plot is by far the best part of this and so I will really try and avoid any spoilers as this is really something that should be experienced first hand. This is very similar in feel game play wise to Amnesia, but where that was horror of a more supernatural nature here the horror comes from sci-fi. 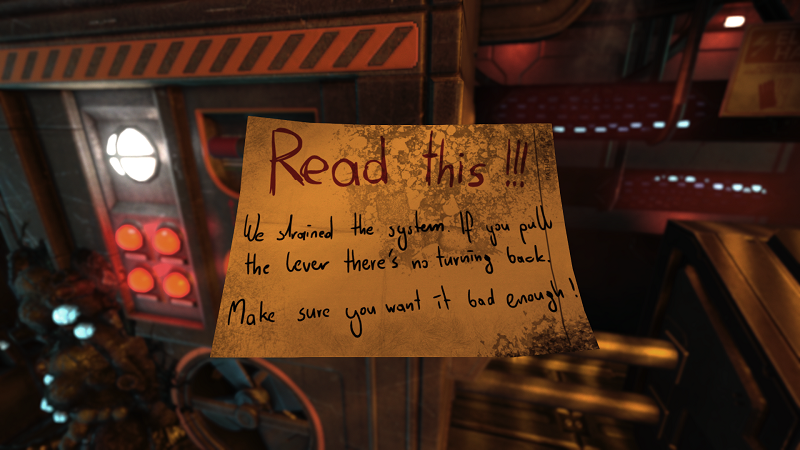 As Simon you explore the abandoned science stations looking for a way to complete your mission, there are simple puzzles to solve, and plenty of files and echoes that give you insight as to what just has gone so completely wrong. Just under half of the game also takes place outside in the ocean. Puzzles are mostly done via computer screens but are varied and their inclusion always seems logical. 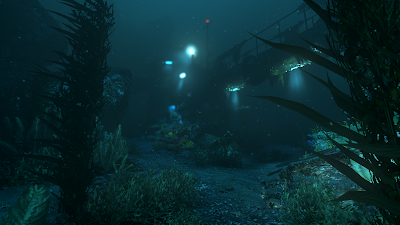 An under sea facility screams Bioshock and this has some similarities but this actually comes across as a far more believable location, everything is made for practicality, not for comfort here. Interior locations are all industrial in look, made up of claustrophobic corridors and cramped rooms full of machines and computers. The whole game world is dark, you have access to a naff torch but other than that you need to rely on lights in the environment to guide your way. The majority of the enemies you face are in these interior locations, ranging from robots to monstrous creatures, each roams the environment on their own, giving chase should they see you. There are only a handful of enemies in the whole game but I actually found these sections could be annoying. It is very tense and scary being chased, but if you get cornered and killed it can be a bit frustrating to have no way to defend yourself. You have health of sorts in that you can be caught twice before you face the game over screen, plus your health (as it were) can be regained by certain objects. Exterior locations are much more open, this isn't like the narrow outdoor sections of Bioshock 2, instead you get vast maze like areas to navigate. The murky depths make seeing much in these quite challenging and so feel just as confined as the interiors giving an unsettling feel to them. At one point the whole place is caught in an underwater storm, having to find your way by following distant lights gave a real feel of exploration, sign posting in Soma is simply fantastic, it always feels like you have discovered the way rather than the game subtly pointing you there. Horror comes from the sense of isolation, this oozes atmosphere more than even WAU. Enemies are frightening to encounter due to their rarity but a sense of unease is maintained throughout by the dark environs and classic horror tropes such as hallucinations. When I first found that the enemies were robotic rather than monsters I admit I felt a bit let down, I had expected strong horror which the first sections did not really give. However I came to love the sci-fi setting, it felt really unique, everything that happens is explained in terms of science, sure it is the future but it was good to get explanations for what happens, the sense of mystery draws you on. While Simon is alone, you do get to speak to Catherine a heck of a lot, she provides plenty of back story, the voice acting is superb. There are many other characters you discover along the way, the majority are recorded transmissions of peoples last moments before they died but a few times you come across friendly A.I. One memorable early encounter has you speaking to a robot trapped under rubble who is convinced it is a human. There are many moral choices you can make as you progress, the game does not punish you or force you down certain paths which made these choices all the more impactful, such as choosing to turn off the life support for characters you meet. 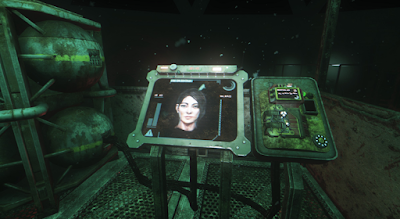 By far the best part of Soma (aside from the amazing atmospheric world) is the story, or more the themes that it goes into. The biggest theme being; just what makes a human human? On many occasions the plot made my head fizz, it is very deep and has a load of really clever things to think about, clones, A.I and the meaning of life all feature at some point or another. I just can't go into this part of the game, it is the best part but also needs to be the part you as a player experience. You feel responsible for your actions even when you have no choice. A subtle early on part has you needing to destroy a robot in order to get it's control chip, after doing this a small robot that had been following and helping you up to that point now recoils in terror whenever you try and get near it, really made you feel about if your actions are actually correct. When humanity is over just how do you carry on? What about the worst parts then? 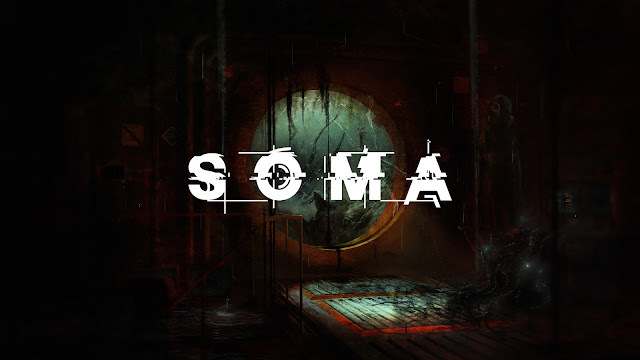 First off the load times for Soma are crazily long, initially starting the game was so long that I began to think it had crashed. It is telling that my biggest fear for dying came not from the terror that would entail, but instead knowing I would face a long load time should I perish. There are no long loads once you are actually playing, but on many occasion the game will freeze as the next area is loaded in. The frame rate also stutters at certain points, it got really really bad at a few points. Soma also crashed a few times while I played, again annoying but hopefully this will all get fixed in patches. The H.U.D is minimal which is fine but on occasion I forgot what I was meant to be doing and there is no way other than quitting your game and reloading to find out what to do. Hilariously I spent over 30 minutes stuck in the very first room because of not paying attention! On a personal level there is a cartoony art style used for photos that felt out of sorts with the rest of the game, photos show people as super exaggerated even when the actual people you encounter look realistic. I was hooked on Soma, I could not stop playing it for the 8 or so hours it took to finish. The thinking mans Bioshock that proves you just do not need combat to make an engaging game. I was not sure going in but this may just well be the most effective horror I have played for years. As a bonus below is the second half of my bizarre self imprisonment at the very start of the game, I was being very dense!